Alkene Hydrohalogenation is the reaction in which a pi bond is broken and a halogen added to the more substituted or ‘Markovnikov’ position. 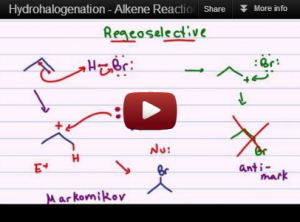 This is Video 2 in the Alkene Reaction Mechanisms Video Series. Click HERE for the entire series. Hey Leah, I am confused on how you marked a 3 carbocation on the cyclopentane but it looks like a 2 carbocation. I was slightly confused on that part. Just want some clarification. Which point in the video? Very helpful video. You’re #1! Hey Leah, the video was really helpful but I’m confused about stereochemistry that results as part of alkene reactions. Do you discuss that in later videos? thanks! thank you so much , what’s the role of CCl4 reagent in the hydrohalogenation of double bond ?? Thank you. Are you in a summer course or preparing for the Fall? I give you two thumbs up!! I just cannot believe how helpful your videos are. I sit in class for hours and understand nothing I watch your videos or a few mintues and I unersand it SMH!! !